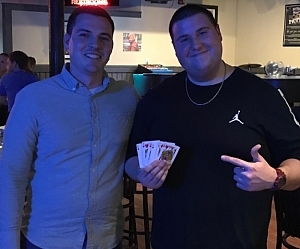 Dan and John, the boys from Granger, IN and rookie participant’s in this spring’s CCA Euchre league at Brickhouse Piano Bar, took home first place in the tourney Wednesday evening. It wasn’t without a challenge, though. After three weeks without a single loss, they faced a winner-take-all game 3 matchup against the Free Agents in the championship. After a back and forth start to the final game, Dan and John under the moniker Euchre 574 broke away to win it all. Congratulations to the winners and all who came out to play in the spring Euchre league! !